It's Z Feud time again! 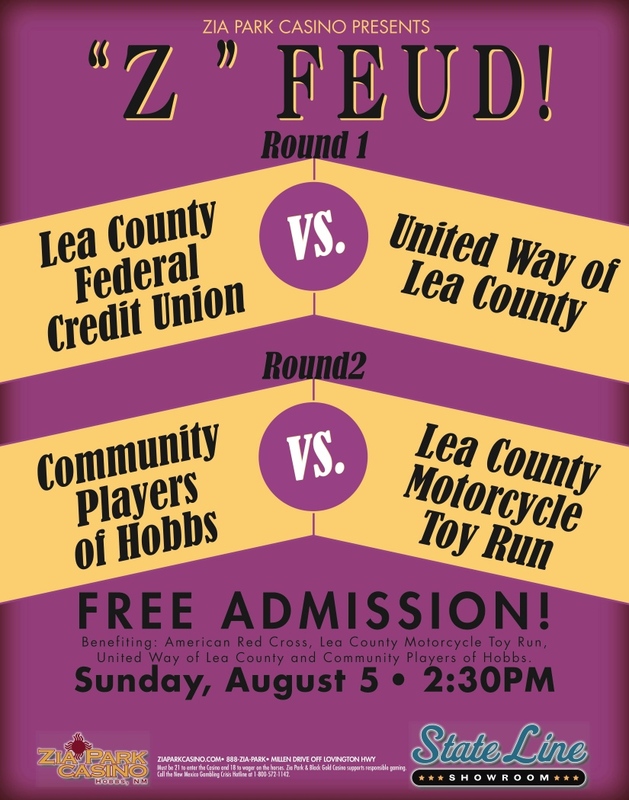 Come out to Zia Park Casino on Sunday, August 5th at 2:30 pm, and watch the Community Players of Hobbs team compete once again! Last year we were narrowly edged out by the Zia Group. 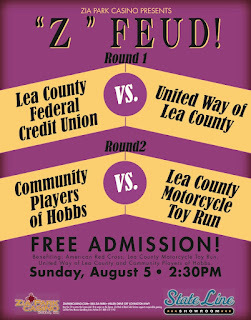 This year we face the Lea County Motorcycle Toy Ride. Come out and cheer us on! The Playhouse team consists of Erin Anderson, Ronnie Gray, Kim Hill, Shoshana Howell, and Robert Schumacher. 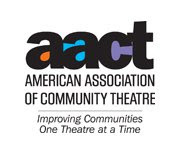 We need any and all volunteers to assist in set strike for "Aladdin, Jr." on Sunday, 7/22/12. Please come to the Playhouse at 3:30 PM if you can assist. Better yet...come see the show at 2:00 PM and stay for strike! Thank you, and hope to see you there! 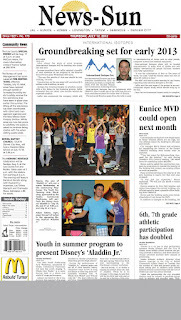 "Aladdin" makes the front page! 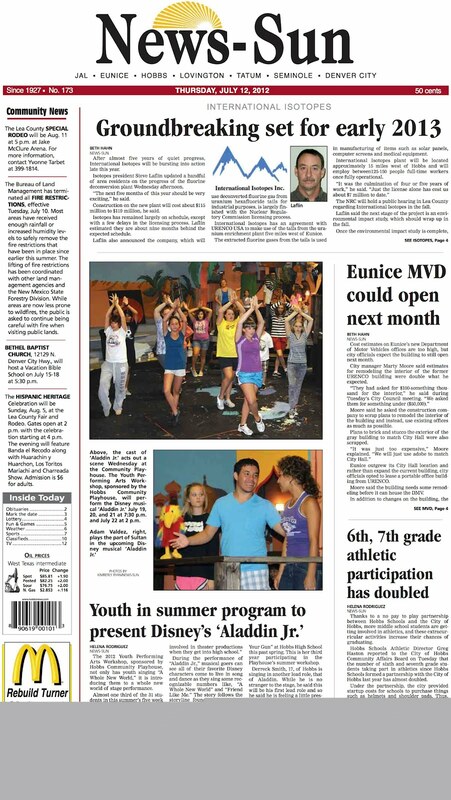 Check out the Thursday, July 12th edition of the Hobbs News-Sun for a front-page look at the upcoming Youth Performing Arts Workshop production of "Aladdin"! On correction to the continued story on page 4...the address to get tickets online is http://www.communityplayersofhobbs.com (click the ticket icon on the left). Tickets are also on sale Mon-Fri 11 am - 2 pm and 5:30 - 7:00 pm at the Playhouse. "Aladdin" show dates are July 19, 20, 21 (7:30 pm), July 22 (2:00 pm). Audition notice for the melodrama "Oil's Well That Ends Well"
Auditions for the melodrama "Oil's Well That Ends Well" will be held at the Playhouse on Sunday, August 5th at 2 PM and Monday, August 6th at 6:30 PM. "Oil's Well That Ends Well" will be directed by Glynese Floyd. Show dates are September 21st, 22nd, 28th, 29th (8 PM), and September 23rd& 30th (2 PM). Tickets are on sale for "Aladdin, Jr."! Come see our 2012 Youth Performing Arts Workshop production of Disney's "Aladdin"! All your favorite Disney characters come alive in song and dance! Show dates for "Aladdin" are July 19, 20, 21 (7:30 pm) and July 22 (2:00 pm). All tickets $10. Tickets are now on sale at our online box office (click here, or on the ticket icon on the left), and you can also get tickets at the Playhouse Mon-Fri 11 am - 2 pm and 5:30 - 7:00 pm from now until opening night!